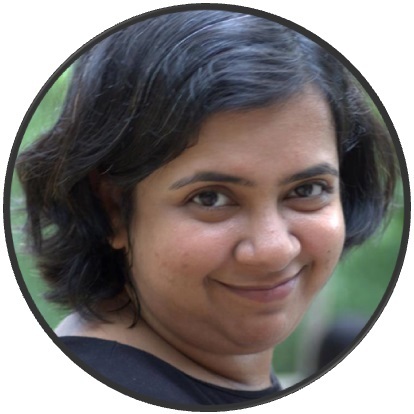 This is another favorite north-Indian dish. It is healthy, tasty and very quick to make. 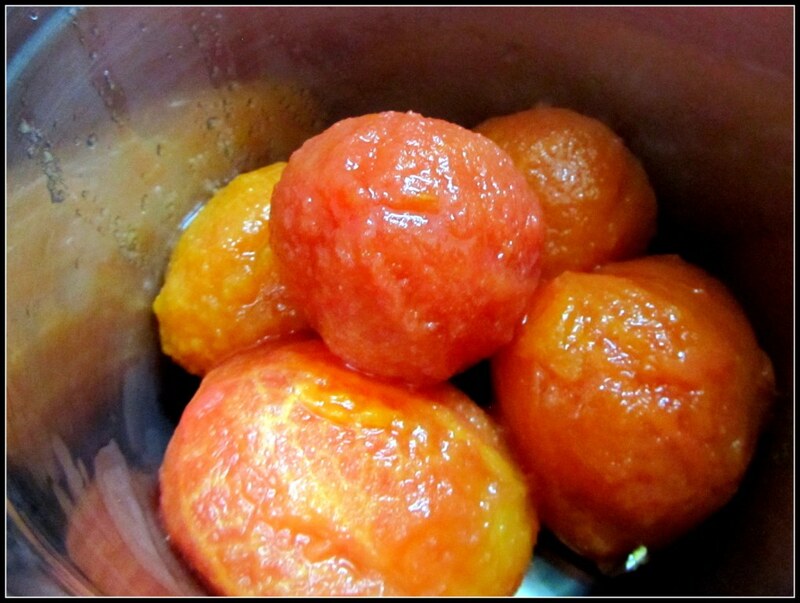 Now it is time to cook the tomatoes. Put some water for boiling in a pan add the whole tomatoes. Boil the tomatoes covered for 5 minutes or so. If you see the skin is cracked then tomatoes are ready for the next step. Get them out of stove and keep them aside. It would help the next stage if you can take the tomatoes out of the hot water as well and put them in room-temperature water. Then they will be cool enough for peeling. 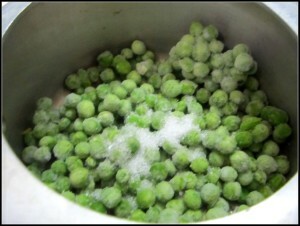 To cook the frozen green peas fast, take a pressure cooker, add the frozen peas and a small spoonful of sugar and close the lid. Two whistles are good enough. You do not need to add any water in the pressure-cooker, provided the peas are frozen. 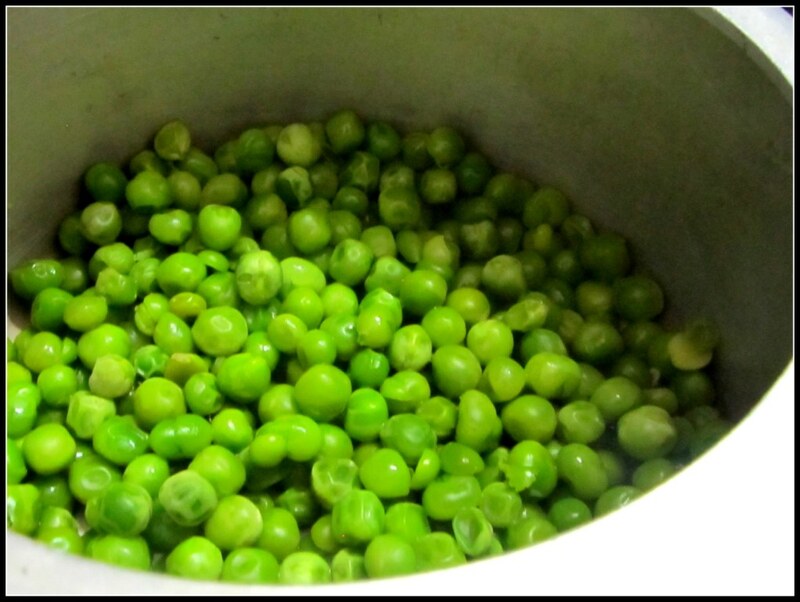 In case you are using fresh peas, then please add some water in the pressure cooker before closing the lid and putting it on the heat. Do not open the pressure cooker just yet, keep it aside, we will check the peas later. While your tomatoes and peas are cooking, cut one medium size onion and couple of garlic cloves. I hope by the time you are done with your onion and garlic, one of your stove-top will be free (I am assuming you have double burner stove). 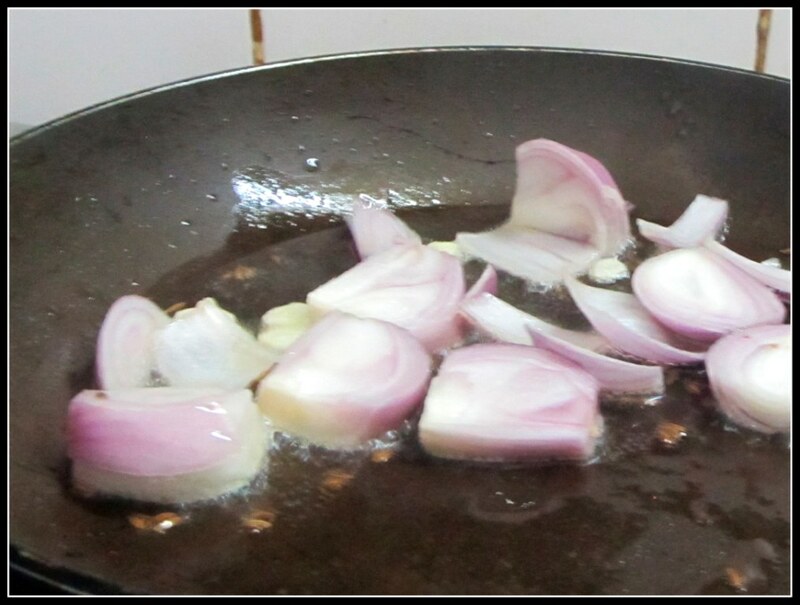 Put a frying pan or kadai on the stove and add some oil in it. 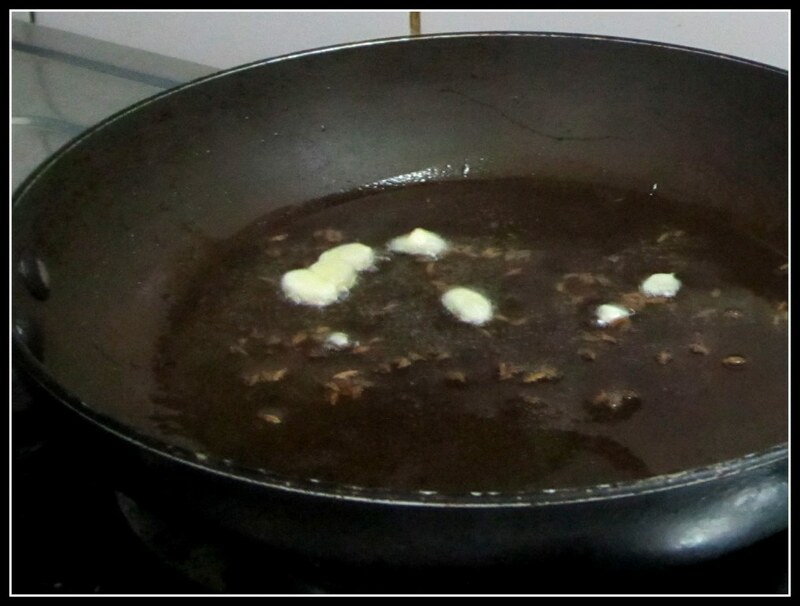 When the oil is hot, add some whole cumin (jeera) seeds and the garlic. 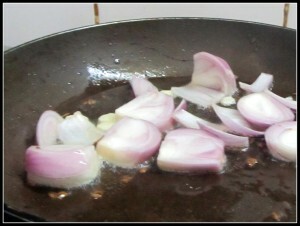 After sauteing for few moments (10-15 seconds) add the onions. Cook the onions till they lose their firmness a little. 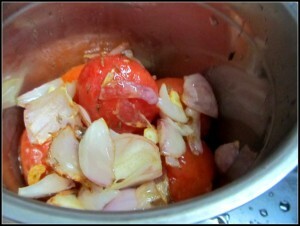 While the onions are cooking, peel the tomatoes and put them in a blender. When the onions are done add them in the blender as well. 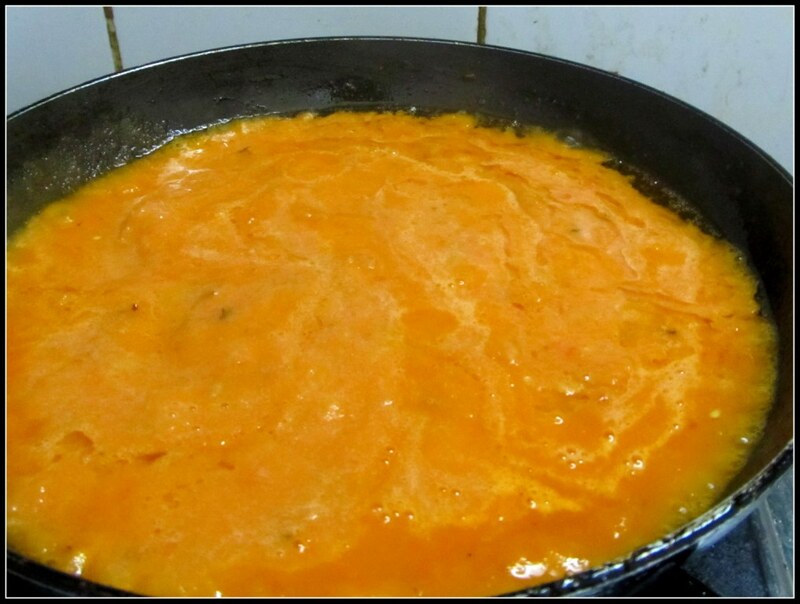 Blend till you get somewhat smooth red tomato sauce. 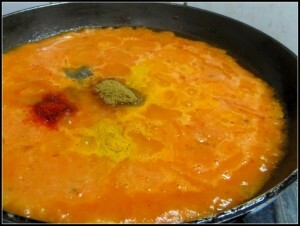 Add the salt and all other powdered spices and mix. While the tomato sauce and spice mixture is simmering, open the pressure cooker. In case the cooker is not opening, run it under tap water for few moment and it should do the trick. Add the green peas in the tomato gravy and simmer it for couple of minutes. 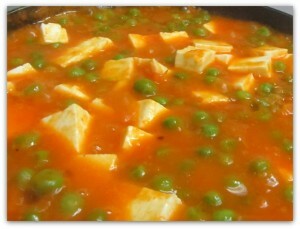 Add the paneer cubes now, mix with the gravy and immediately take off the heat. You should not cook paneer for long, it makes it very chewy and hard. Anyways they are made from milk, so you can eat them raw as well. 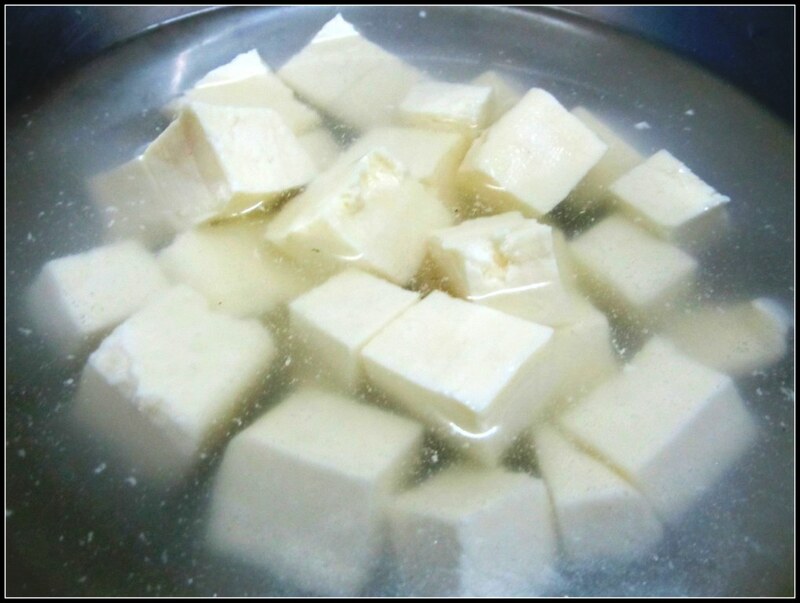 Cut the paneer into 1″ cubes and immerse them in salt-water. Boil some water in a saucepan with a pinch of salt. 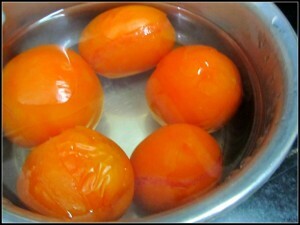 Add the tomatoes (whole and washed) in the boiling water and boil for 4 to 5 minutes. 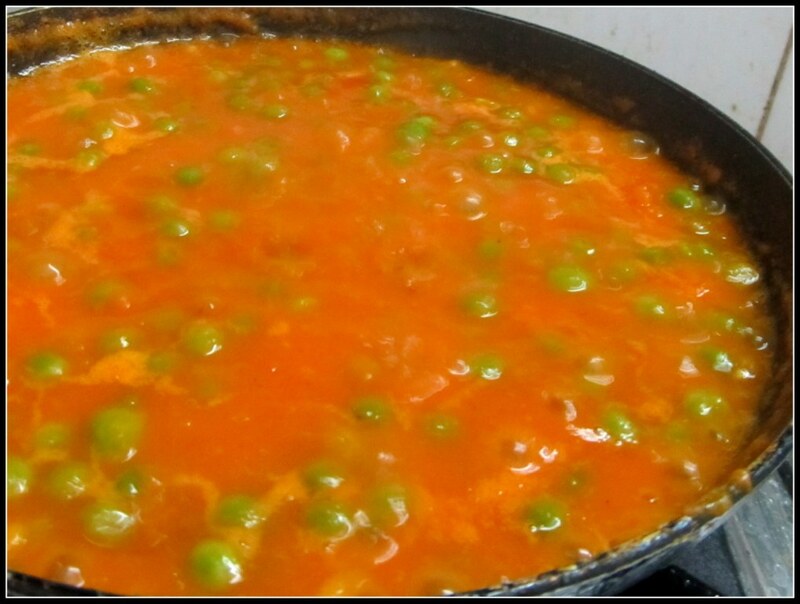 Take the tomatoes out of the heat when the skins are coming off or you can see cracks in them..
To cook the peas, take a pressure cooker and add all the frozen green peas in it. Add a pinch of sugar. Close the lid and give two or three whistles. Keep it aside. Put a frying pan on heat and add oil. When the oil is hot add cumin seeds and garlic. Saute for a moment. Add the Onion and saute till they look a bit transparent. Take the skin off the tomatoes and add them in a blender along with the fried onions. Blend till you get a smooth tomato sauce. Put the frying pan back on heat again and add the sauce you have just prepared. Add the green peas, mix. Simmer for a minute or two. 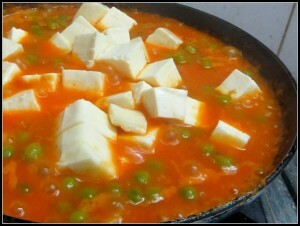 Add the paneer, mix and take the pan off the heat. Your Matar Paneer is ready to serve with rotis, chapathis or parathas.